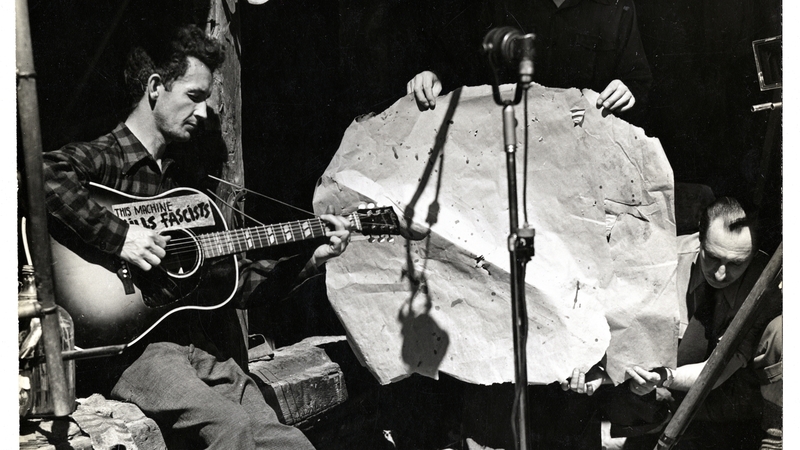 Woody Guthrie singing, Smithsonian Folkways image – The sticker on Woody’s guitar reads, “This Machine Kills Fascists.” Woody regarded music as a great tool of democracy and freedom. 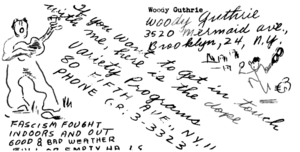 July 14, 2012, marks the 100th anniversary of the birth of Woody Guthrie, folksinger, union organizer, chronicler of American values, troubles and change. We’re already more than halfway through Woody’s centennial year — and what celebration took place at Millard Fillmore’s Bathtub? History slips by so fast. Much celebration remains. Get out your calendar and figure out which events you can join in. Perhaps fittingly, Millard Fillmore’s Bathtub hits the road again, today — off through Oklahoma. In the interim, get out there, get the history, and join in the chorus! This entry was posted on Saturday, July 14th, 2012 at 4:54 am and is filed under Dust Bowl, Folk Music, Great Depression, History, Labor and unions, Music, Politics, unions. You can follow any responses to this entry through the RSS 2.0 feed. You can leave a response, or trackback from your own site.